Blue is a color that will go with just about everything. It can be worn for both casual and formal occasions and can look chic and elegant no matter what the season. But in the summer, the color blue always seems to have a fresh look about it. Navy and ocean inspired shades are particularly popular in summer and that’s no different for summer 2018. Blue always looks great and it’s a color that suits everyone. It can add sophistication to a business suit and can give you a cool, summer look at an evening event, helping you to feel more confident. 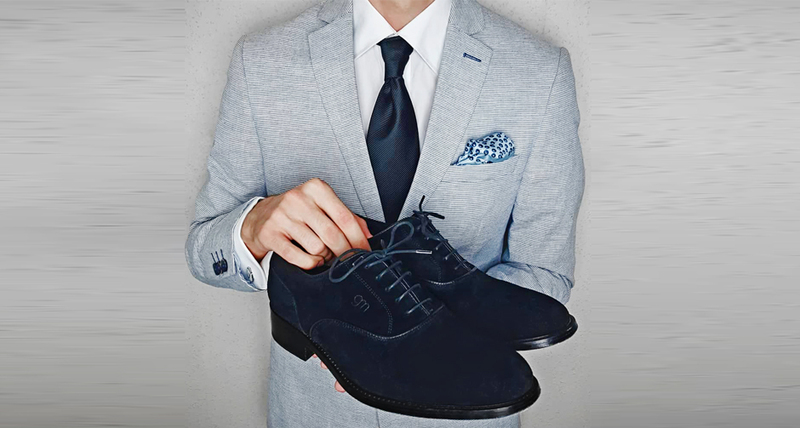 Another thing that can make you feel more confident is your footwear. And the luxury handcrafted elevator shoes from GuidoMaggi can not only boost your confidence but they can also boost your height to give you that extra few inches that you’ve always desired. To stand out for the right reasons this summer, the Posillipo comes in one of this summer’s hottest hues. These gorgeous ocean blue Oxford height increasing shoes are handcrafted in Italy using Cordovan leather for a more luxurious feel and look. These elegant shoes are ideal for a dressy summer evening or a summer wedding. They will also increase your height discreetly up to 3.1 inches to improve your self esteem and boost your confidence for the occasion. The great thing about the color blue is that it can be worn for any occasion. So for a casual event you can still stay on trend with the stylish Bolton sneakers. These handcrafted Italian sneakers will increase your height by 2.6 inches and will give you that casual look you’re after for long summer days. These shoes are designed with both comfort and style in mind, so they’re lightweight as well as trendy, with their soft, navy blue leather upper and lightweight white sole with built-in height increasing system. For a sportier casual look there’s also the Bruges. These elevator sneakers can increase your height by a massive 4 inches, helping to boost confidence and keep you on trend. The dark blue suede leather upper combines with a lightweight sole to give you a comfortable shoe for everyday wear during the summer and beyond. A blue shoe in any style can add a chic touch to your outfit and can help to bring your whole summer look together. And with the luxury height increasing styles from GuidoMaggi you can enhance your overall appearance and your mood.